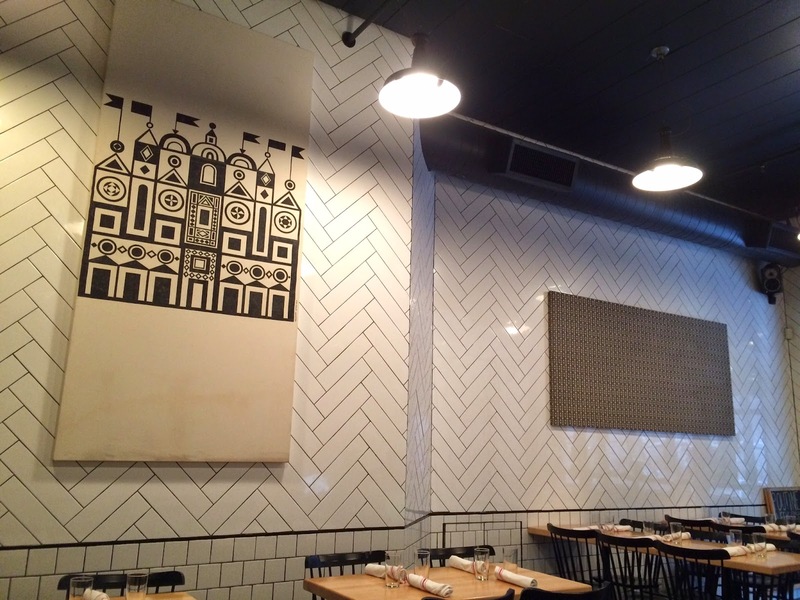 2 people I met on the airplane in a row talked about Mile End in Brooklyn recently. And one of them was my husband's friend from business school and her husband sent an article about Poutine Week menu served at Mile End. 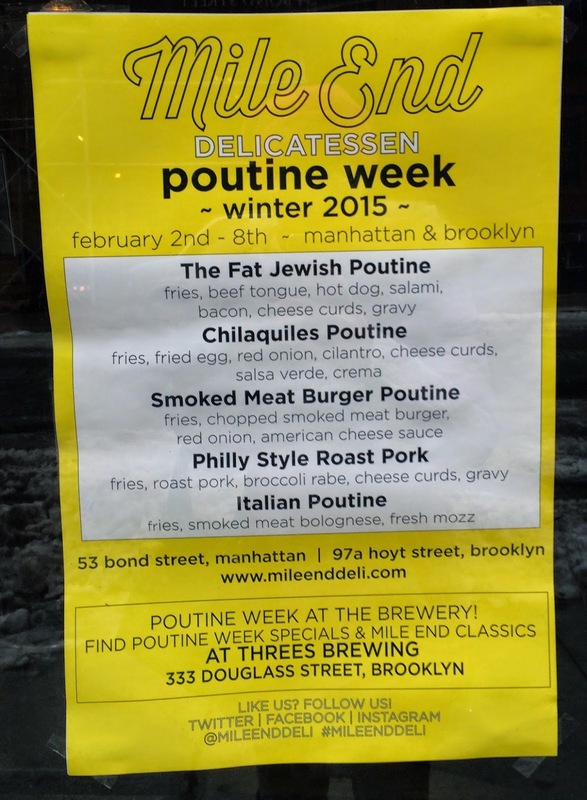 As I'm back in NY since yesterday, I decided to go and try one of the 4 special poutines called "The Fat Jewish Poutine" at NoHo branch. 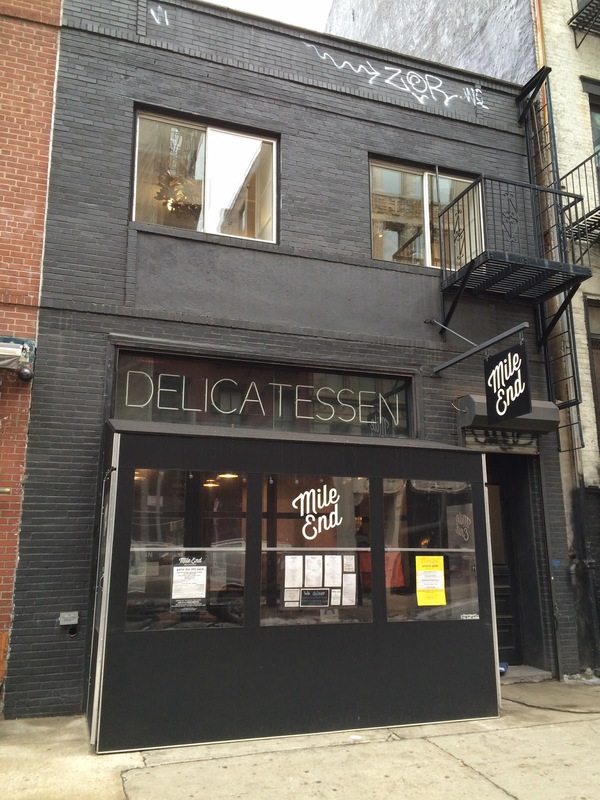 Mild End opened in Brooklyn in January 2010 and one of the owner is from Montreal to bring Jewish comfort foods. 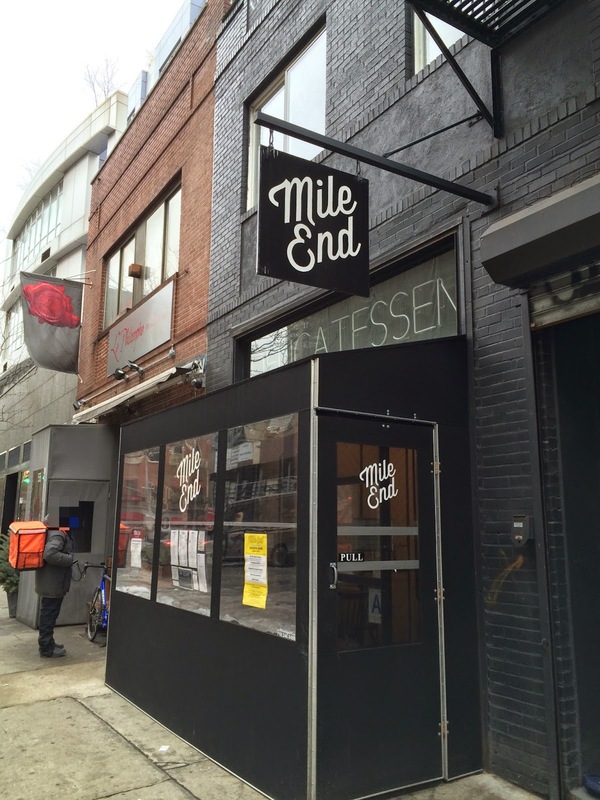 * Mile End is a name of principal Jewish area in Montreal. I got there at 10:55 AM and there're 2 other costumers seating. 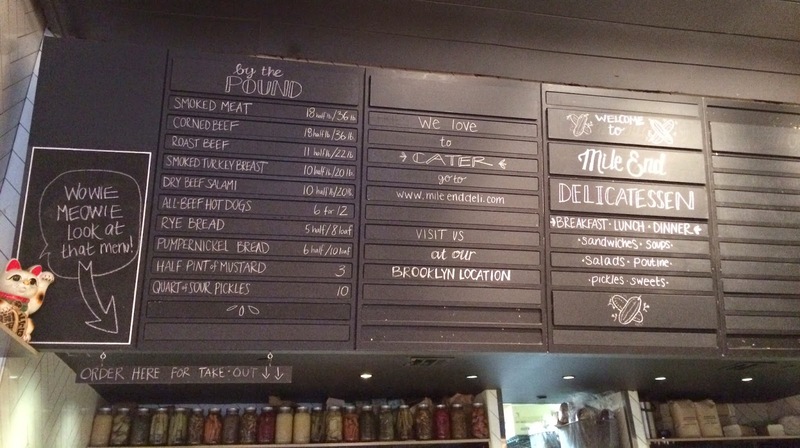 No employee said hi till I said hi, and I proceeded to the counter and ordered "The Fat Jewish Poutine." The employee didn't type in but looked at another employee and once the other employee said ok, she typed in. I was asked here or to-go, so I said here and seated. Soon a bottle of water and a glass were brought, and I thought it'd be served in about 10 minutes at the longest. However, it never came, nobody came to update the situation, 2 Mexican chefs were shouting and cooking, and I was half asleep at the table. Finally, after 25 minutes, The Fat Jewish Poutine was served but no word of "bon appetit" or even "sorry for making you wait." 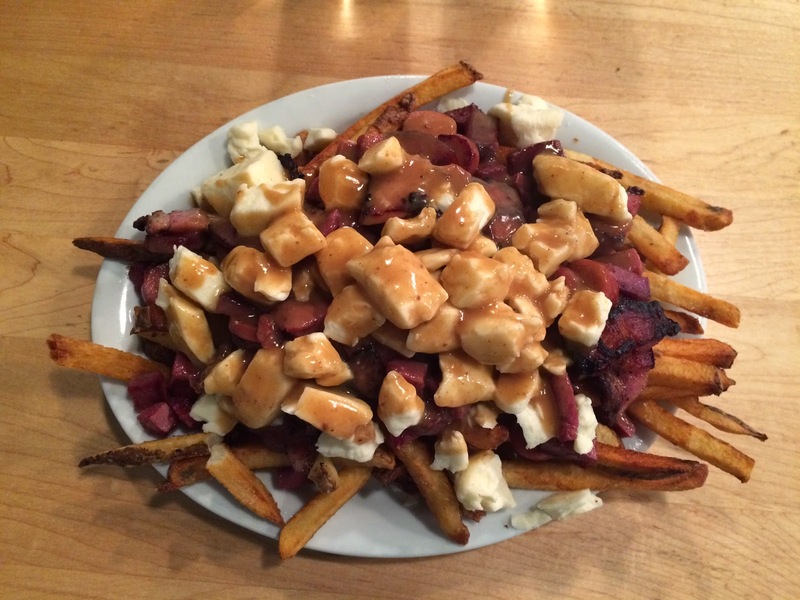 And it's the first time to know how large the poutine was and I started thinking this won't be that reasonable. They asked me if I'd need ketchup or mustard, but I said no. 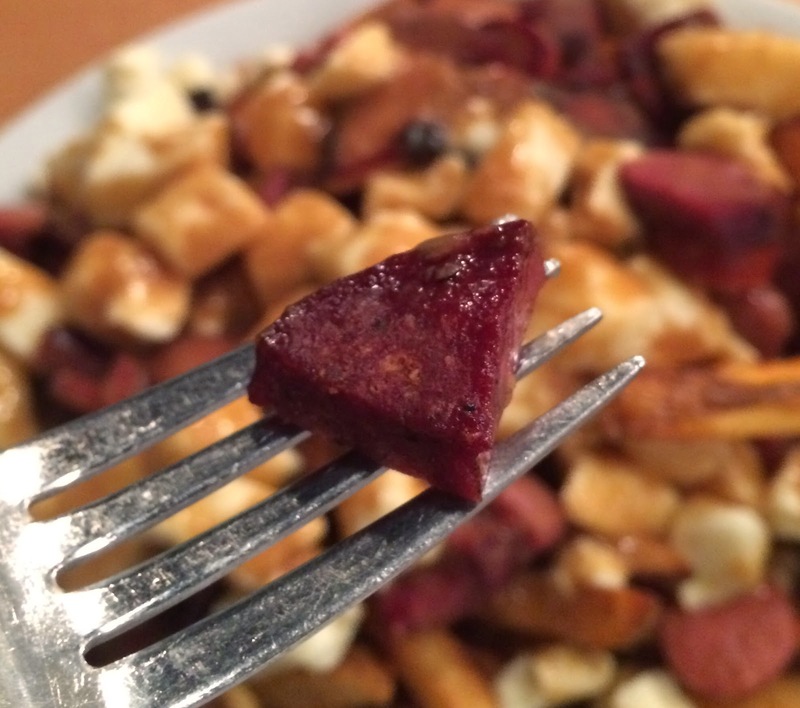 It's my first time to be asked that question and I personally don't put anything on any poutines and eat it as the way it's served. I think the plate was about 25cm (9.8 cinch) crossways. 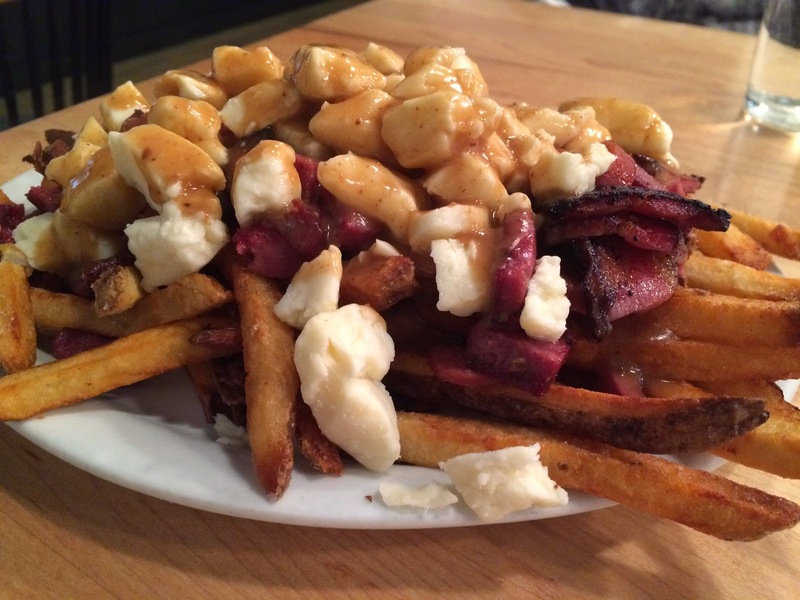 Over the fries, there're gravy sauce and cheese curds, and the 4 characteristic ingredients of The Fat Jewish Poutine; bacons, salamis, hot dogs (sausages) and beef tongues. I asked one of the employees why it's named Fat Jewish as it's not Kosher to start with as it consists of meat and dairy item, and even pork are used, then she said that it's named after a comedian whose handle name is "Fat Jewish." Fries were medium-thick cut, salted and had skins on. They had crispy surface and moist inside, but somehow they smelled weird like burnt and oxidized. Gravy sauce was starchy and quite salty. 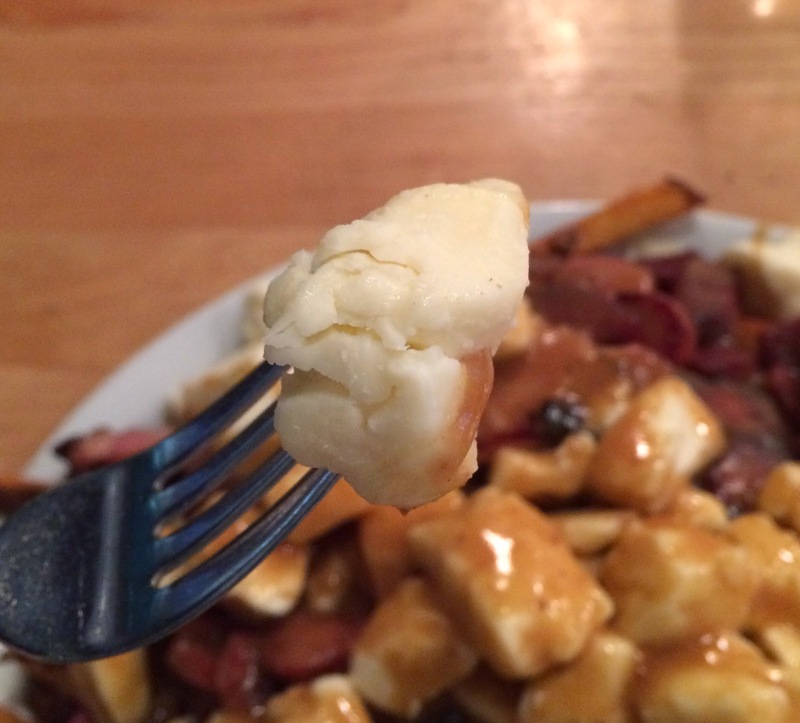 Cheese curds were large and had nice chewiness but incredibly salty. 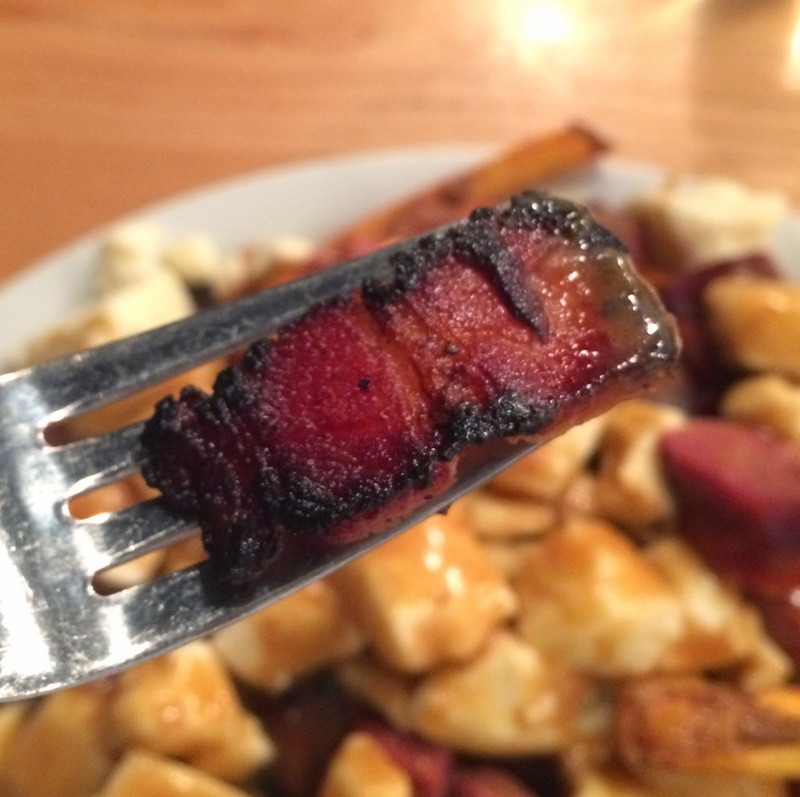 Bacon was sauteed or grilled and one side had burnt edges. But the other side wasn't and it's crispy, juicy and didn't have pork odor. 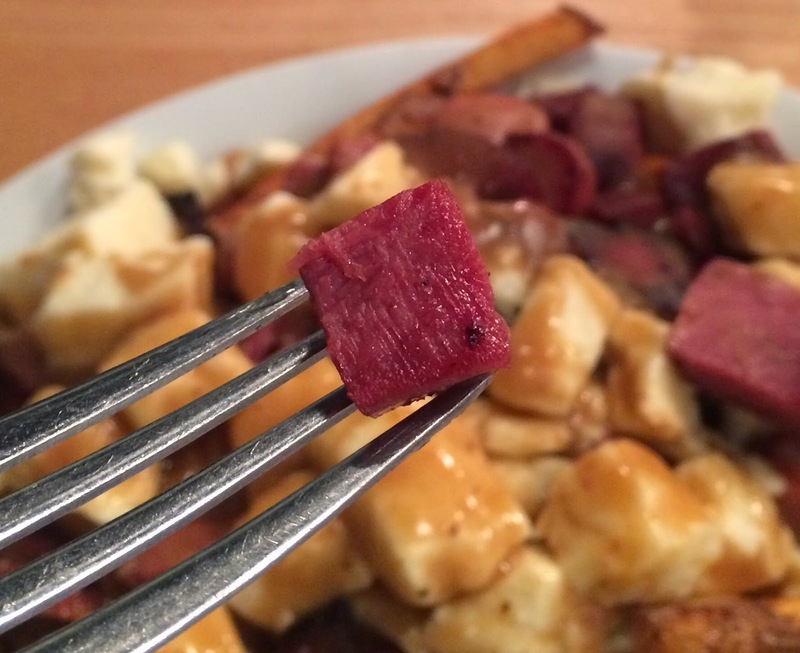 Salami had herbal scent and had bitter and weird mediciny flavor. Hot dogs had skins on and the skin was crunchy and the flesh was plain and soft. 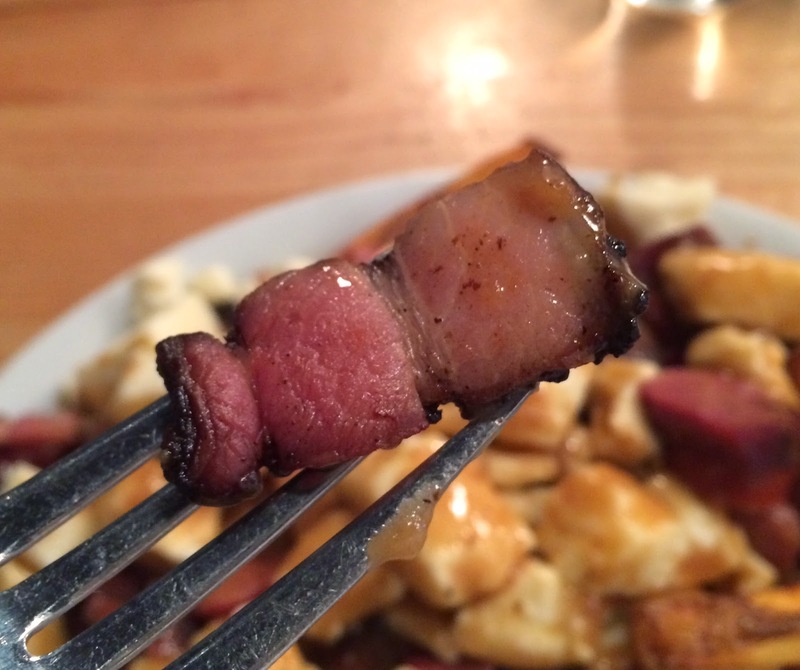 Beef tongue was cut into mini squares and they're soft, slightly rubbery and had the distinguish tender-yet-crunchy texture. This one was also very salty. Salted fries, salty gravy, salty beef tongue and weird flavored salami made me even sick this time besides the portion. I ate about a half of the dish but there's no way I could finish this. When I got a check, one of the employees said if I wanted to take the rest to home but I said no because it's too salty and my husband won't eat this toppings. And she said, "It's quite large and you should have come with your friends" with blankness. 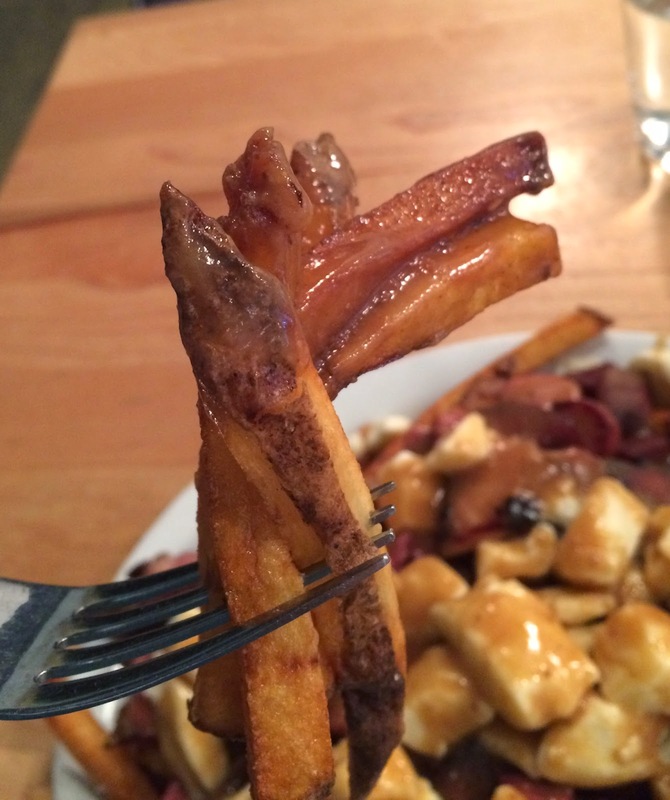 Well, then they could have told me this poutine would be very large in advance and/or offer a half size to start with. 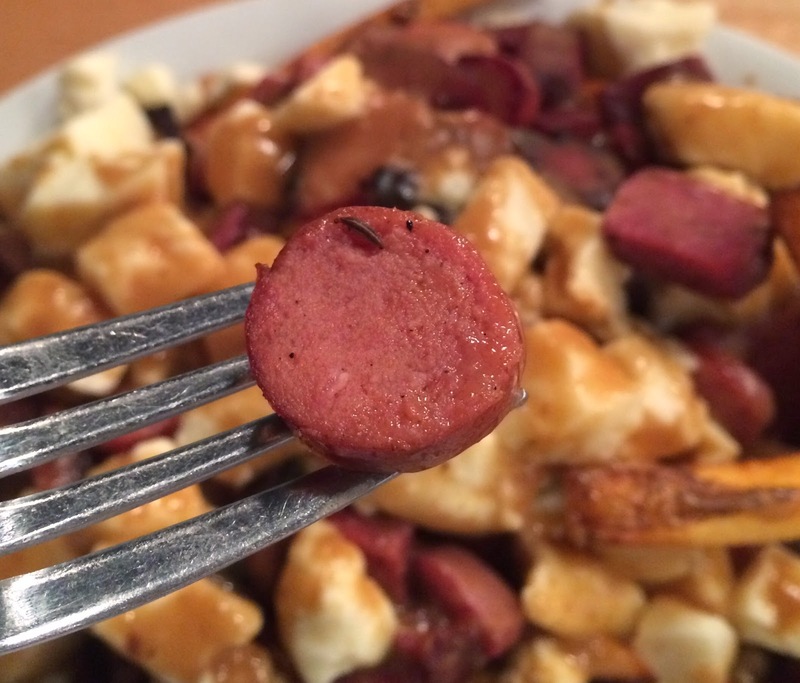 It's 20 dollars before tax, and I guess it's adequate for the portion and the ingredients but except hot dogs, I didn't really like any part of this poutine; lethally salty.